Little Lady Monthly Stickers – This Christmas is a lil’ bit less about me and more about this little girl I’m expecting in just around 6 weeks now (ah!). These adorable month stickers are calling my name for photo opps. Clarisonic Mia 2 – I’ve tried this a few times in spas and adore how clean it makes my face feel. I need my own to use everyday. Brim Papery Motherhood Print – Love, love, love this print by the local Brim Papery. I want to hang this in Baby Hamman’s nursery. 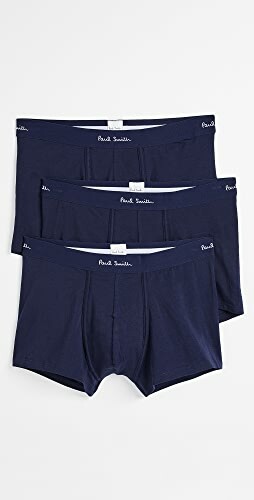 Nordstrom Pajamas – I have a pair of these that I wear all the time and I just love how soft they are. 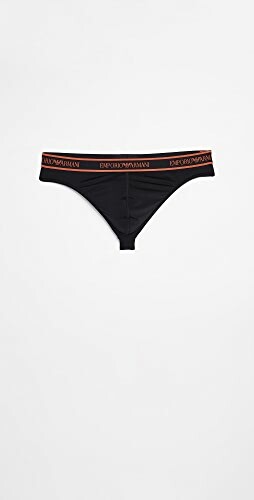 Not too hot to wear during the warmer months but they can transition into the winter months nicely as well. Dr. Dennis Gross Glow Pads for Face – My go-to self-tanner. I use these after I exfoliate for a safe, year-round glow and I’m currently out! Aden + Anais Short Sleeve Kimono Romper – I love everything Aden + Anais because it’s all so soft. 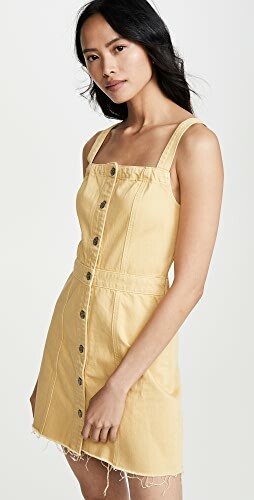 This is such a fun outfit for my lil’ girl to wear come springtime! Stuart Weitzman OTK Boots in Black – because you don’t want to wear heels but still want to look fancy when you’re pregnant. My “I better be extra good so Santa will bring them” gift. S’Well Water Bottle in “Sparkling Champagne” – I don’t like using throw-away containers and I have heard so many positive reviews about the S’well brand. Apparently the bottles keep things cold or warm, whichever you need, for hours upon hours! Essential Oil Diffuser – because I have been dying to try these to see if they really do work as well as everyone says! Brighton Tee in black from Kit & Ace – We love how versatile this top is! 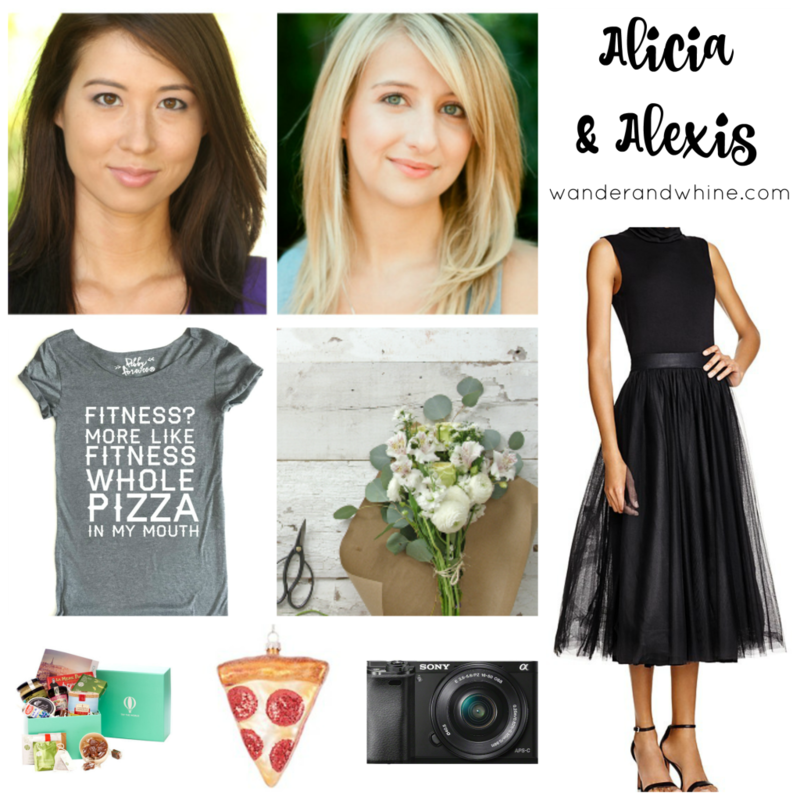 It can be dressed up or down, plus it’s SUPER comfy! Doo Over Spray (dry shampoo + hair spray) by Kevin Murphy – Can be found at The Blowout Bar and other select salons – It’s a two in one product that works as BOTH a hairspray and dry shampoo. It’s a one and done product! Find it at the Blowout Bar or Alycia Johnson in Salon Lofts. Victoria Secret Yoga Pants – These bottoms never sheer out and they come in so many cuts + colors! Frank Coffee Body Scrub – Nothing smells as good as this body scrub! Just one handful and our bodies are completely exfoliated and moisturized. Gift Card to Charles Penzone for a facial (from our friend and aesthetician Jaden at the Dublin location) – This hour long session is perfect for targeting problem areas on the face, and it even includes a hand, neck, and foot massage! Prada Candy Perfume – My FAV!! A Chatbook Subscription for your IG feed – I’ve already got mine in the sweet little paperbacks (only $8 for 60 images) but they just launched their hard back option too. So easy to make right thru the app on your phone! 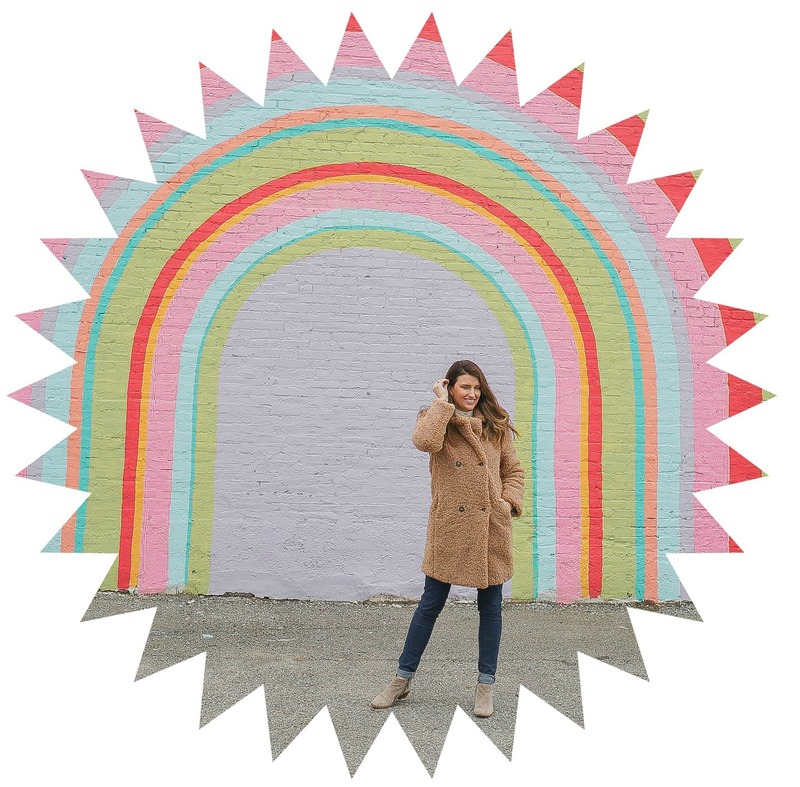 Gap Coat – I totally ordered this coat for myself! With all my discounts I think i got it for $30 shipped!!! Heart Snapshot Mix Print from Minted – The cutest!!! Etsy Gift Card – Expecting twins I can NOT stay off Etsy. My cart is overflowing with custom onesies, sweet little hats and swaddles. 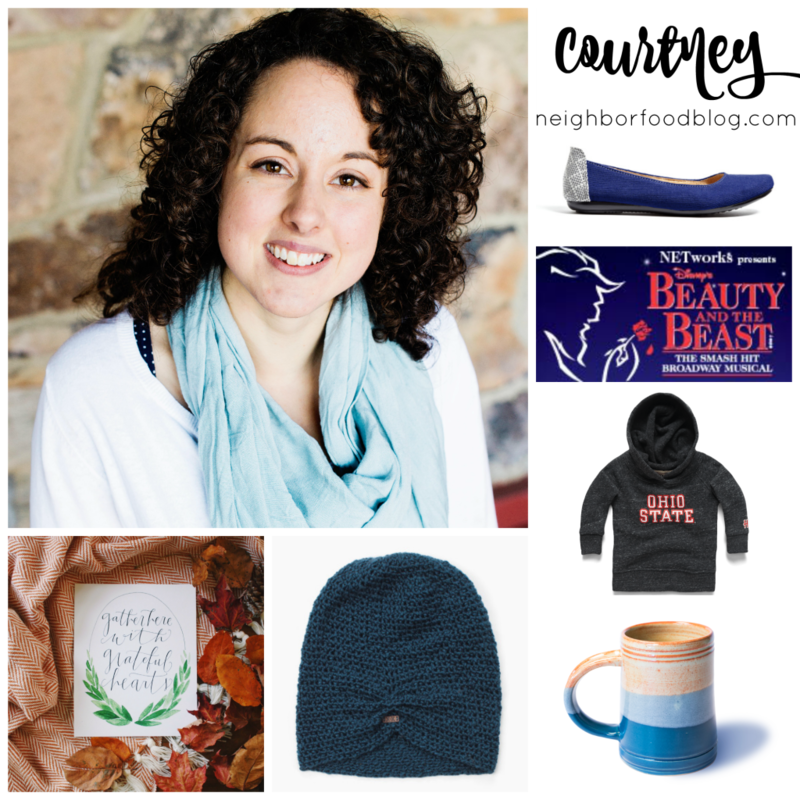 I haven’t pulled the trigger yet and I’m hoping Santa might slip an Etsy Gift card in my stocking!!! 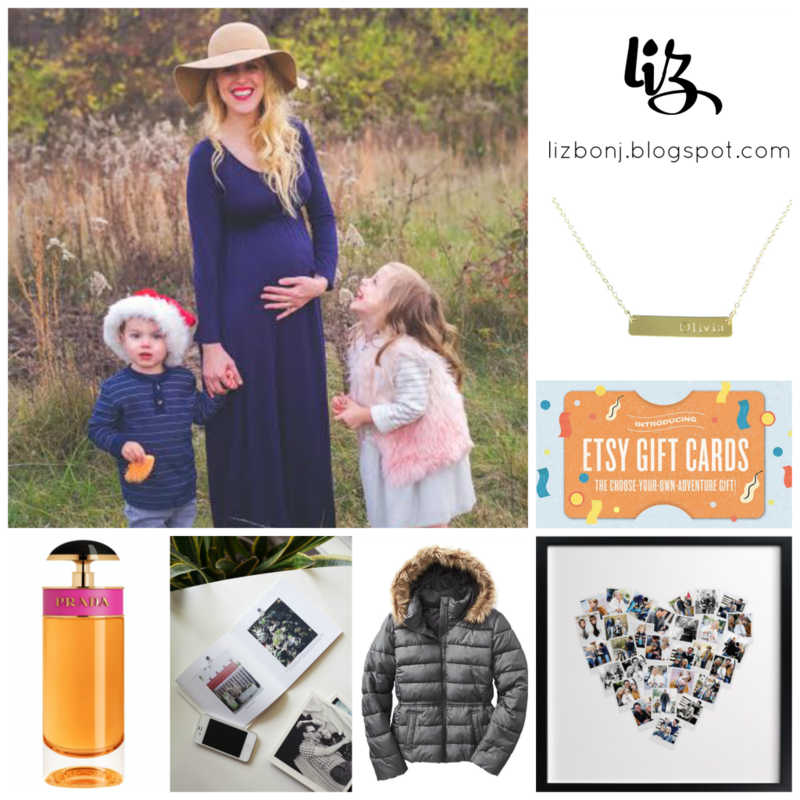 Jewelry from Bip and Bop – I’m obsessed with pretty much anything from Bip and Bop. The feather pendant, hand stamped bar necklace, and pink quartz are all on my list!! 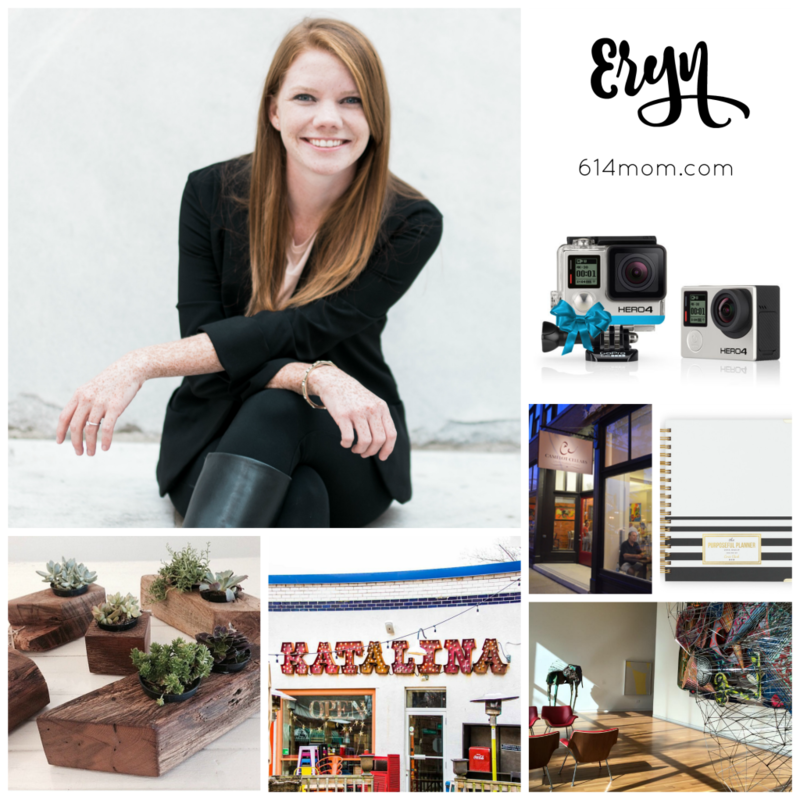 Ginger Jar & Elephant Ears Print – Plants are kind of my thing. My husband and I recently bought our first house so home decor has been on the front of my mind. I have the perfect spot for this adorable print! Side note: I’m totally on the hunt for a real life pot exactly like this. Threshold Gold Flatware – Gold flatware is everything. Need I even say more? 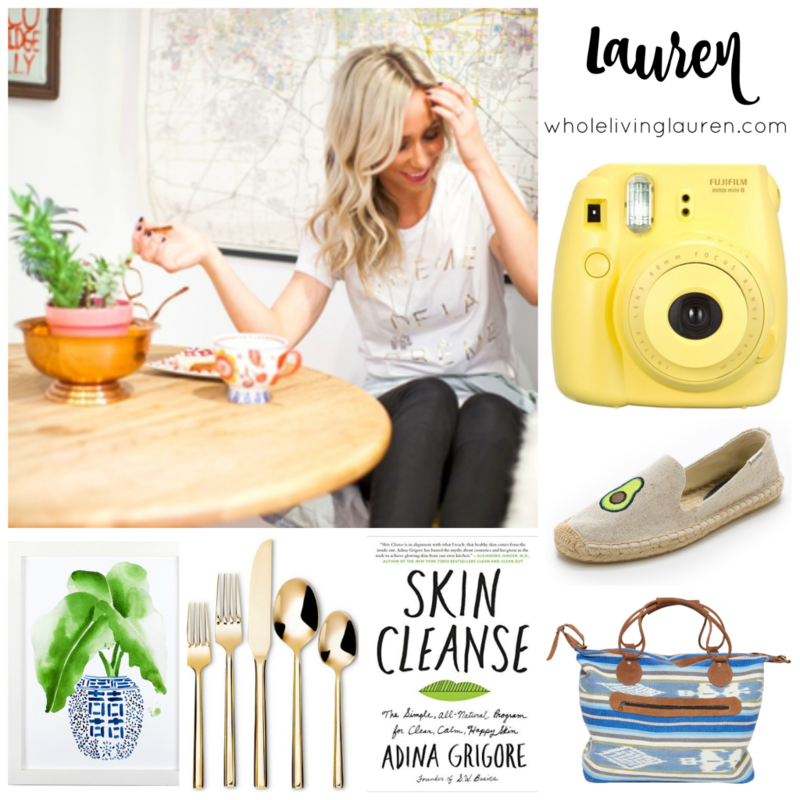 Skin Cleanse (Book) – I have been really into skin health lately…especially when it involves real, natural ingredients. I can’t wait to dive into this holistic guide to healthy skin! Overnight Bag – Half Moon Bay from The Little Market = My husband and I love to travel and have some fun plans for 2016. This bag is the perfect carry-on: functional and (most importantly) stylish. Jason Polan Avocado Slippers – I am totally in love with anything and everything avocado. These slippers speak to my avocado loving soul. Fujifilm Instax Mini 8 Instant Camera – I recently went to a party where the host had a Polaroid camera for us to take fun pics on all night. It was a total hit. I have been obsessed ever since! The Curious Barista’s Guide to Coffee – I’m obsessed with coffee and love trying different drinks. I’d love to learn more about my favorites with this book. Snowflora Soy Candle – Who doesn’t love a good candle? This balsam & cedar one helps make your home a little more festive! 2016 Travel the World Desk Calendar – I’m always daydreaming about my next adventure and what better way to do that than with this calendar? Jonathan Adler Brass Ring Bowl – Something small and sparkly to keep track of all my rings! Nautical Wheeling Earring – I love the color of these ones. These are super simple, but just enough to add some sparkle to any outfit! Stoneware Mugs – In the winter, you need cute mug to drink all of your hot drinks from. I love these handmade ones. GoPro Hero4 – I love adventure, my family, and Columbus and my wishlist really reflects that. I’ve had my eye on a GoPro for a couple years now and with some upcoming travel plans, it’s at the top of my list. Family Membership to the Columbus Museum of Art – I enjoy exploring Columbus in new ways and while I have always loved The Columbus Museum of Art, now that my daughter is old enough to enjoy it with me, I really want a membership. Introducing her to art early on is really important to me. A Date to Camelot Cellars to Handcraft My Own Wine – I am a firm believer in nurturing your relationship with your spouse and because of that date nights are really important to us and we often gift unique date nights and creating our own wine at Camelot Cellars, seems like the perfect date night – fun, romantic, and new. Corie Clark Purposeful Planner – I like to stay extremely organized and this planner does everything I need it to and more; shopping lists, water checks, health, quotes, and goal sheets. Plus it’s gold and black, no need to say anything more. Absolutely anything from Rework Furnishing – I really have my eye on their cutting board. Coasters from Columbus Coaster Company – Both (Rework and Columbus Coaster Company) create beautiful work and are so passionate about Columbus. 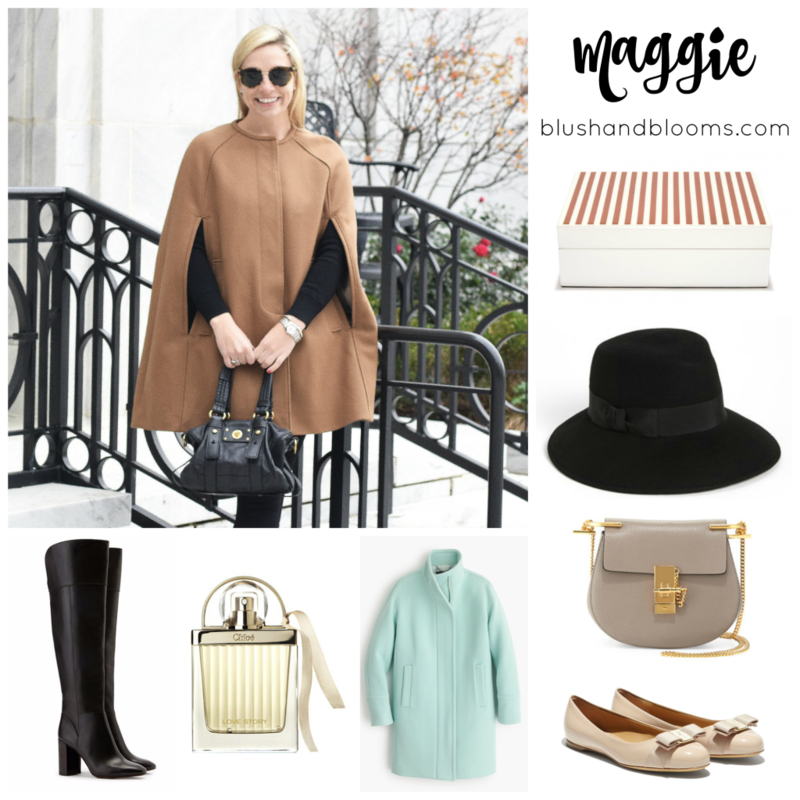 J.Crew Cocoon Coat – Coats make the outfit in winter! I get so tired of wearing the same coat day after day that I started collecting coats. This mint color is gorgeous and feminine, and I currently do not have any colored coats. Jewelry Box – Although I already have a jewelry box, I have a few of my grandmothers jewelry pieces and I want to keep them separate. This box is the perfect size and I love the colorful strips on the lid. Chloe Shoulder Bag – I love the Drew bag! In real love with it– beautiful, classic, out of my league–everything that I want in life. Tory Burch Knee-High-Boots – I want boots to go out in at night, something dressy to wear in the winter…. honestly, I am hoping it will make my legs look longer. Eric Javits Fedora – I am self-proclaiming myself as a hat person—even though I look terrible in them. Still I have always wanted one, and this one seems classic. So if you see me in one, lie and tell me I look good with it on. Salvatore Ferragamo Flats – My grandmother used to wear Ferragamos and I have always wanted a pair. They are a classic shoe and are comfortable! Plus they have a bow on it, and I am all about that. Chloe ‘Love Story’ Perfume – I like to collect perfumes and Chloe’s ‘Love Story’ is my next victim. Color me weird–even though it smells lovely, I mostly want it because I think the bottle is pretty. Michael Kors Puff Ball: Just for fun. It is a fun little way to change up your purse. Zara Camel Wool Coat: I’ve been wanting a nice camel wool coat for a couple years now. It is a great staple piece that I’ll be able to wear for years. Plus I love Zara and wish we had one in Columbus! Cluse Watch: I currently don’t have a watch and I love being on time for things. Plus I love the simplicity of this watch, can go with all my outfits! Ipod Nano : New Years Resolution, join a gym and be better about working out. I don’t like working out with my phone because I like to be disconnected when I’m exercising. An ipod nano is the perfect size to fit in my hand or throw in my pocket. Planthropy Succulent: I’d like a plant that is easy to take care of and looks nice in my apartment. Plus I love hers because they are in decorative vintage pots and are super cute! J. Crew Stadium-Cloth Cocoon Coat – J. Crew introduced this killer coat last winter and I wanted it then…but I’m glad I waited to add it, because this year they re-introduced this great jacket with a variety of new hues including this golden yellow! One of my most favorite colors to wear is yellow! So, naturally, this is a must have for my winter wardrobe. I think adding a little pop of color to this year’s outerwear will make the gloomy winter days more tolerable! Bauble Bar Acid Fringe Tassel Drops – I recently ordered these beautiful baubles for a client and decided that I needed them for myself! What’s not to love about a wine colored tassel earring? I plan on channeling Pantones 2015 color of the year, Marsala, for the rest of my life by way of these earrings. Michael Kors Sutton Saffiano Leather Satchel – I’ve been in desperate need of a new classic structured handbag for quite some time and when I spotted this one at Nordstrom’s awhile back, I just new it is was the ONE. 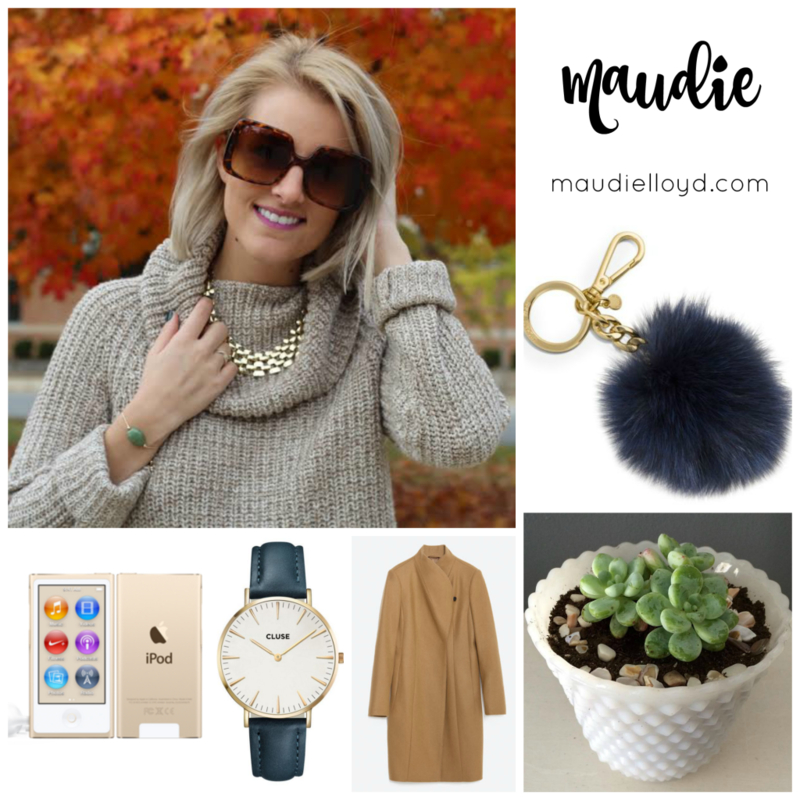 Steve Madden Austin Bootie – While doing some daily pinning via Pinterest about 2 months ago, I happened upon these booties and knew they needed to be mine! 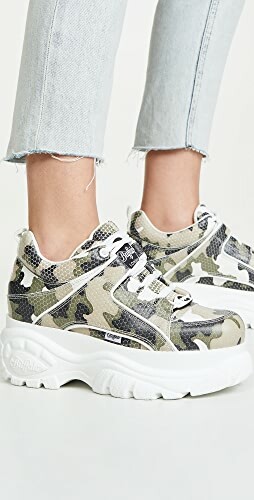 After discovering how amazingly affordable they are (only $99.95), I knew they were most definitely something I could add to the Christmas wishlist! I particularly love the fact that these booties have the potential to be transitional into Spring and Summer. Karen Walker Super Duper Strength Sunglasses – I consider myself a loyal Ray-Ban wearer, but there is just something about these Karen Walker frames that keep calling my name and I figured Christmas would be the most ideal time to ask for these babies, since they are more expensive than Ray-Ban. If I happen to get these babies, I will most definitely create a look combining them with the J. Crew Stadium-Cloth Cocoon Coat, Bauble Bar Acid Fringe Tassel Drops and the Steve Madden Austin Booties. Sarah Chloe Lana Elongated Signet Ring – For the last year, I’ve been wanting a really nice ring for my right ring finger. Rather than requesting another diamond, I liked the idea of acquiring a more simplistic piece and having it monogrammed with an “R.” Priced at $109, I think this ring would be a great and timeless addition to my jewelry collection. Pebby Forevee Apparel – There’s no shortage of local apparel companies in Columbus, but there’s something special about Pebby Forevee’s comfy and hilarious shirts. This “Fitness Whole Pizza in My Mouth” tee perfectly sums up how I feel about exercise (and pizza). Try the World Subscription Box – We love to travel and taste the flavors of each locale, so I am lusting after the subscription boxes at Try the World. Every two months, you receive a box from a different country bursting with curated, gourmet items. If I can’t be constantly having adventures; I can at least pretend! Food Ornaments – These quirky ornaments are perfect for the foodie in your life! This glittering slice of pizza is one of my favorites, but you can also pick from a burrito, salted pretzel, pickle, cupcake, hamburger, and more. Florals – Flowers on Orchard Lane (Bouqs for local delivery) – Despite coming from a family of florists, the arranging talent skipped my generation! Because of that, I like to leave it to the professionals. Fresh flowers bring so much light and cheer to any room (or front door), and they make me feel more put-together and grown up. They’re an easy gift for anyone — or for yourself! I usually use Flowers on Orchards Lane out of Clintonville, but you can have a beautiful bouquet delivered (same day!) by a local florist using the Bouqs site. Tulle Skirt – I have been lusting after a fluffy, tulle skirt like this one from Bailey 44 for years now, and I think it’s finally time to bite the bullet. Pair it with lace for an uber-feminine look, or a turtle neck for a bit of luxurious refinement, and you’ll look like Grace Kelly in no time. DSLM Camera – Alicia and I have been blogging for almost two years now, and my photography has come a long way — but there’s always room for improvement! I think the next step for me is an equipment upgrade (and I’ve vowed to my husband that I’ll be buying this for myself if it doesn’t end up under the tree!). You hear the most chatter about DSLRs, but DSLMs are another good choice. I’ve read that they are less bulky, and shoot more quickly, while still allowing all the customization that photographers love in DSLRs. Gather Here with Grateful Hearts Print from Brim Papery– I love all of the gorgeous prints, stationary, and mugs at Brim Papery, but I’ve already got a spot picked out for this one in our dining room. Baby Ohio State Hoodie– Let’s be honest, cute outfits for my kiddo are really a gift for me. The Lilly Knit Hat from Krochet Kids- I can never have enough cozy, pretty knits for these brutal Ohio winters. 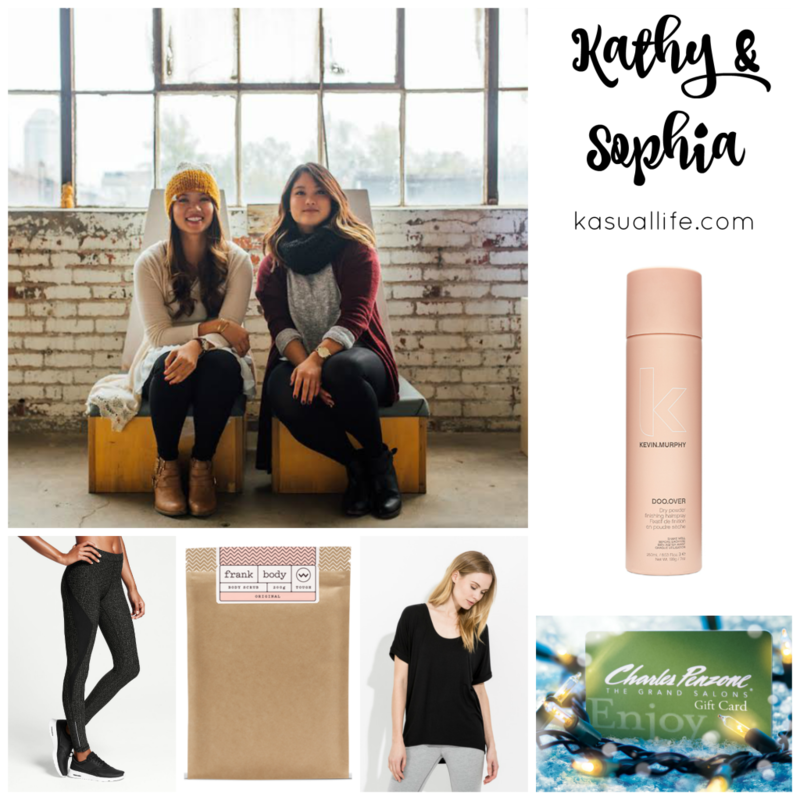 Krochet Kids has the loveliest winter gear, and every purchase helps employ a vulnerable woman in the world. It’s a win win. Gaby Flats in Cobalt Diamond– These flats would definitely become my holiday party go-tos. 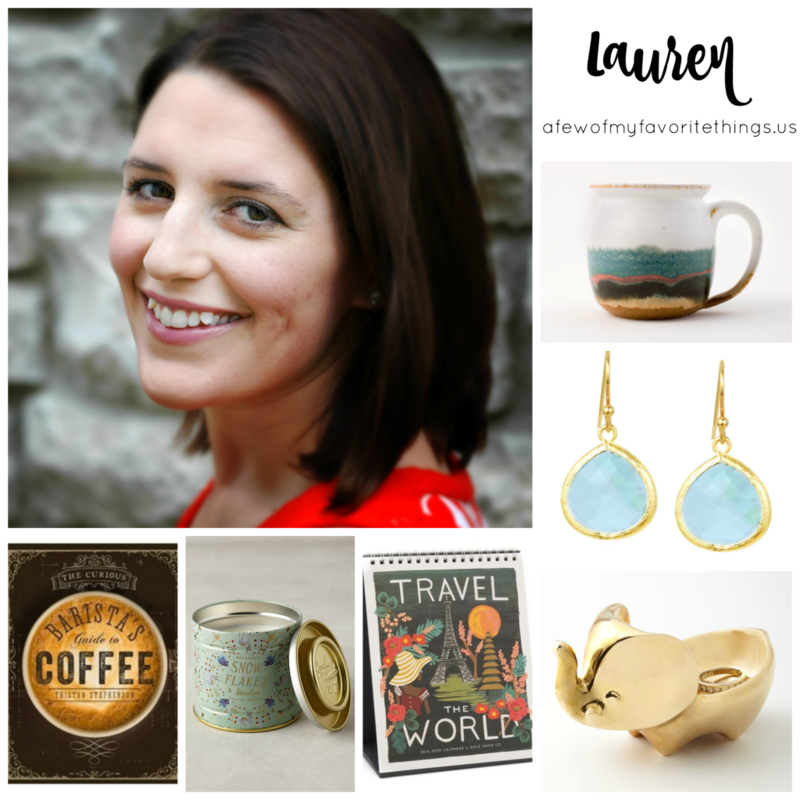 Weekend Getaway Mug from MudLove- Everyone needs a signature mug, right? This one would be perfect for curling up with a good book. Tickets to Beauty and the Beast– My favorite Disney movie is coming to the stage in Columbus in March! I’m just a tad bit excited. 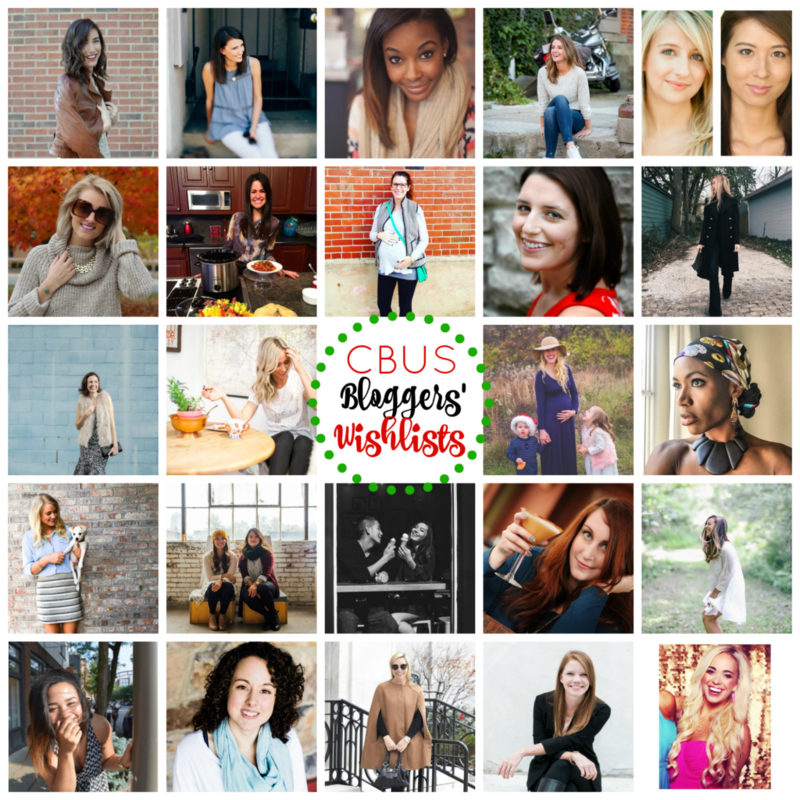 Stay tuned for more Columbus Bloggers’ Wish Lists tomorrow on GAC! 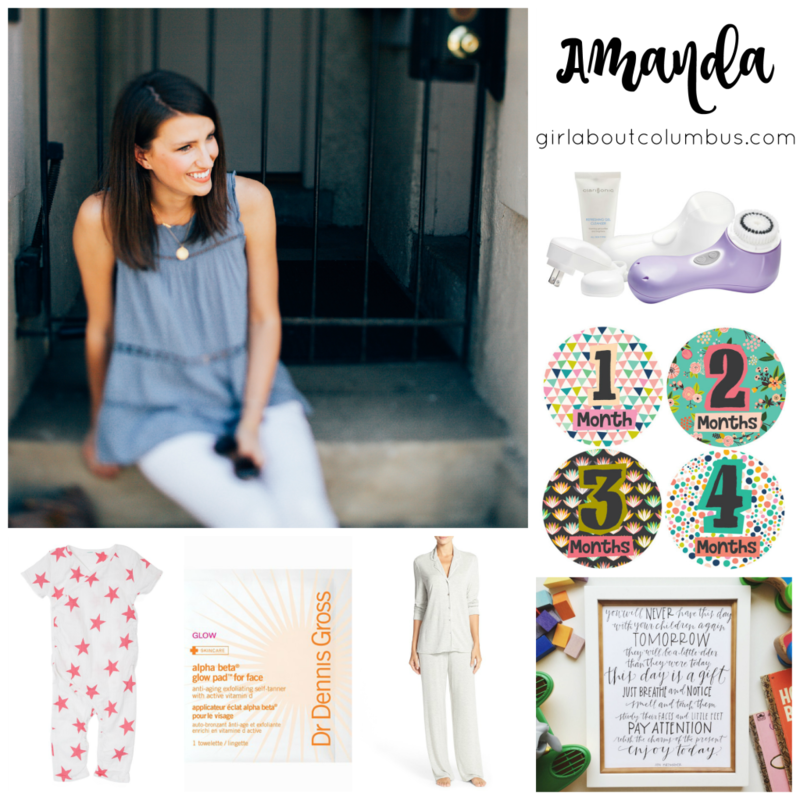 What an awesome list of gifts! 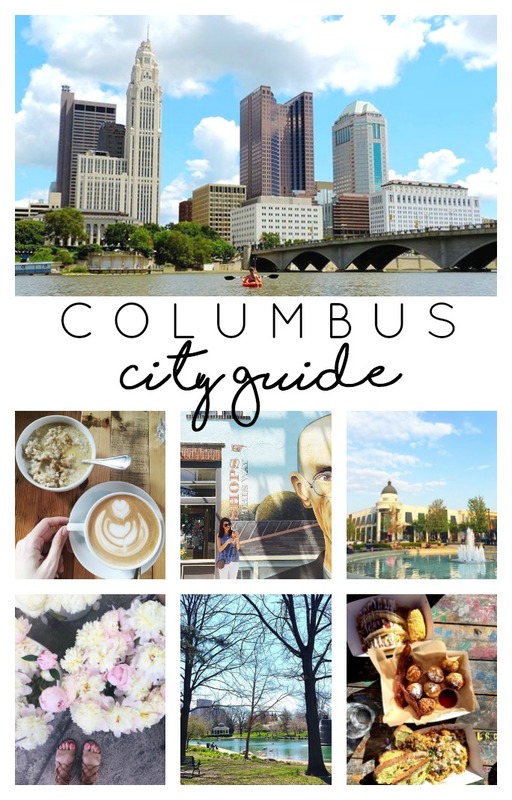 I also love that it introduced me to a few other Columbus based blogs I haven’t visited before! Shop Pink Bikinis, Black Swimsuit, Black And White Dresses, Blue Mini Bags and more. Get this widget.